We keep challenging with an eye on the next generation. we try to become a brand new manufacturer which can adapt to the new era. We hasten our pace of preparation for introducing state-of-the-art equipment,cultivating human resources,and developing new technologies and new fields. as well as focusing on advanced technology. We started our business producing Mizuno-style tri-cars in 1927. 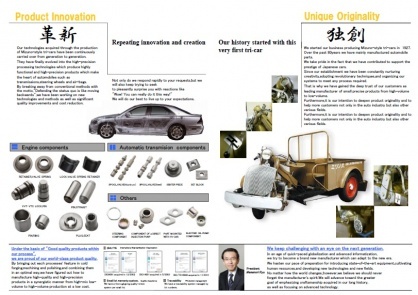 Over the past 80years we have mainly manufactured automobile parts. We take pride in the fact that we have contributed to support the prestige of Japanese cars. Since our establishment we have been constantly nurturing creativity,adopting revolutionary techniques,and organizing our systems to meet any process required. That is why we have gained the deep trust of our customers as leading manufacturer of small precise products from high-volume to low-volume. Furthermore,it is our intention to deepen product originality and to help more customers not only in the auto industry but also other various fields. Our technologies acquired through the production of Mizuno-style tri-cars have been continuously carried over from generation to generation. They have finally evolved into the high-precision processing technologies which produce highly functional and high-precision products which make the heart of automobiles such as transmissions,steering wheels and air-bags. By breaking away from conventional methods with the motto,"Defending the status quo is like moving backwards",we have been working on new technologies and methods as well as significant quality improvements and cost reduction. "Wow! You can really do it this way!" We will do our best to live up to your expectations. 1927 Started business at Shioiri-town,Mizuho-ward,Nagoya-city,Japan. 1944 Moved our plant to Koromo-town,Toyota-city,Japan to evacuate from the air- raids. 1945 Started business with Toyota Motor Corporation. 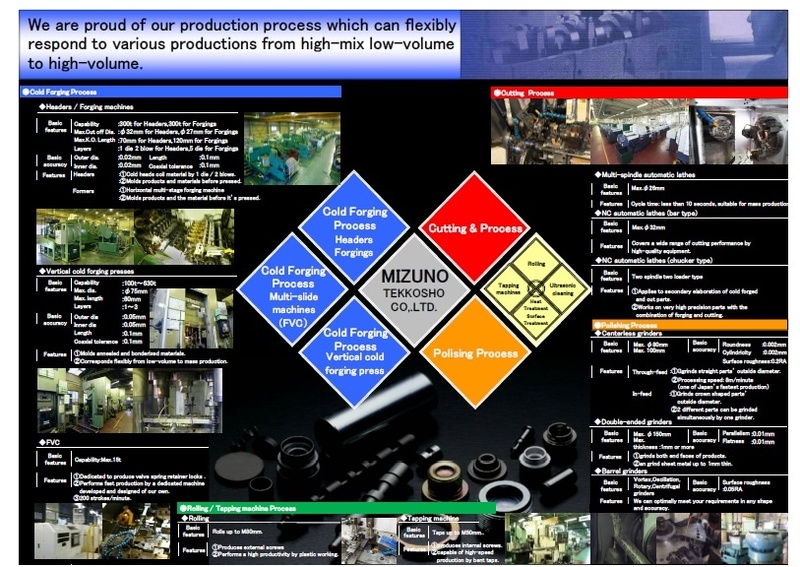 1959 Reorganized and established as Mizuno Tekkosho Company Limited. 1960 Introduced 6-spindle automatic lathes of Schutte,Germany. 1965 Introduced cold forｇing equipments and solidified the foundation for mass productions. 2000 Established our Kuwana plant. 2002 Acquired ISO9001 at our main plant. 2003 Acquired ISO14001 at our main plant. 2007 Celebrated our 80th anniversary of the foundation. 2011 Acquired ISO/TS16949 at our main plant. 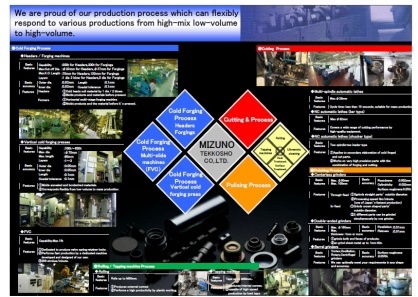 2012 Acquired ISO/TS16949 at our Kuwana plant. 2003 Received the"2002 Superior Quality Performance Award"from Toyota Motor Coporation. 2004 Received the"2003 Superior Quality Performance Award"from Toyota Motor Coporation. 2005 Received the"2004 Superior Quality Performance Award"from Toyota Motor Coporation. 2006 Received the"2005 Superior Quality Performance Award"from Toyota Motor Coporation. 2007 Received the 2006 Superior Quality Performance Award"from Toyota Motor Corporation. 2009 Received the"2008 Superior Quality Performance Award"from Toyota Motor Corporation. 2010 Received the"2009 Superior Quality Performance Award"from Toyota Motor Corporation. Received the"2009 Urgent VA Award"from Toyota Motor Corporation. 2011 Received the"2010 Superior Quality Performacne Award"from Toyota Motor Corporation. Received the"2010 Superior Quality Performace Award"from Hino Motor Corporation. 2012 Received the"2011 Superior Quality Performacne Award"from Toyota Motor Corporation. Received the"2011 Superior Quality Performace Award"from Hino Motor Corporation. Received the"2011 Superior Quality Performace Award"from DAIHATSU Motor Corporation. 2013 Received the"2012 Superior Quality Performacne Award"from Toyota Motor Corporation. 2014 Received the"2013 Superior Quality Performacne Award"from Toyota Motor Corporation. Winning quality control excellence prizes particularly consecutive for prize five years"from Toyota Motor Coporation. Received the"2013 Superior Quality Performace Award"from DAIHATSU Motor Corporation. 2015 Received the"2014 Superior Quality Performance Award"from Toyota Motor Coporation. Received the"2014 Superior Quality Performace Award"from Hino Motor Corporation. 2016 Received the"2015 Superior Quality Performance Award"from Toyota Motor Coporation. Formal company name MIZUNO TEKKOSHO CO.,LTD.